This is a Tayt Waters “mystery”. Mystery being in quotes as there is not really a mystery here. Written in first person, Choguette gives us way too much information too soon, making the plot obvious. First person is hard to write well and in this case, it is as if someone pulled the string on Chatty Cathy and she won’t stop talking. Tayt Waters is trying to run a security company and a cleaning business. One can only hope she cleans better than she provides security. In the beginning, we see her as tough enough to take on shady side jobs where she convinces men to clean up their act in relationships or face Water’s wrath. This would be good if she didn’t lose that fierceness as the story progresses. 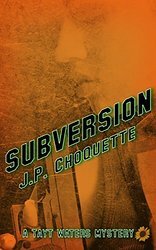 The main weakness is that Choquette tells us the story as opposed to showing us the story. This makes it difficult to read as we are mainly in Water’s head throughout the book. I had a hard time finishing the book and there was little about Tayt Waters to make me want more. This one gets two stars, one would just be unkind.